Add a 4 pack of Bible Markers? Add a popular Dake Book? 2 columns of KJV text and 3 columns of notes. Description: This Dake Bible has 2 columns of KJV text and 3 columns of wrap around notes. Dake's Annotated Reference Bible - The Holy Bible - containing the Old and New Testament of the authorized or KJV Text. With three columns on each page - two of text and three of notes and comments and a complete concordance and cyclopedic index. Words of Christ are in Red; Dakes Annotated Notes are at the end of book. Old Testament and New Testmanet Questions are found at the end of each section. Plan of the Ages by Dake - is at the back of the book. Three column format with text and notes on the same page Complete concordance that lists every Bible word. 9,000 headings to divide text 35,000 commentary notes More than 8,000 outlines for sermons literalizing of Scriputre Definitions of key Hebrew and Greek words Complete summary at conclusion of each book easy fingertip fact finder over 500,000 helpful cross chain references for study. Large Print Dimensions: (Length x Width x Height): 11.54" x 9.4" x 2.17"
Click Here for thoughts on Dake Bible sizes. 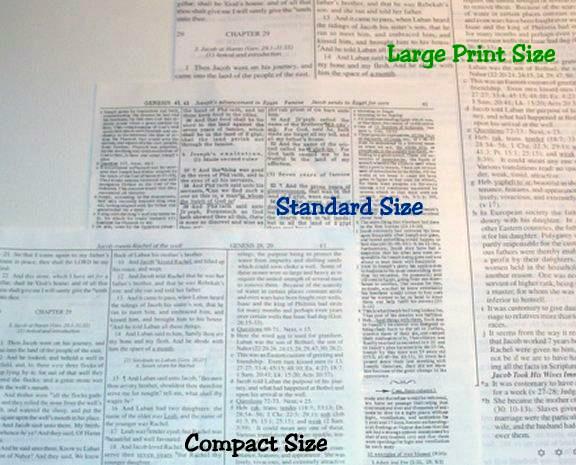 Click Here to see a picture of all three Bible pages of the different sizes. Click Here for more information on the Dake Bible. Click Here for information on Dake's Theology. Click Here to view the PDF version of the Cyclopedic Index found in the Dake Bible. A Reminder: Dake Publishing no longer produces an indexed Bible. You may however select the "Add do-it-yourself indexing" option below to purchase index tabs that you may affix to your Bible yourself. Protect Your Dake: You are purchasing one of the best Bibles on the market today. There is nothing else quite like a Dake! 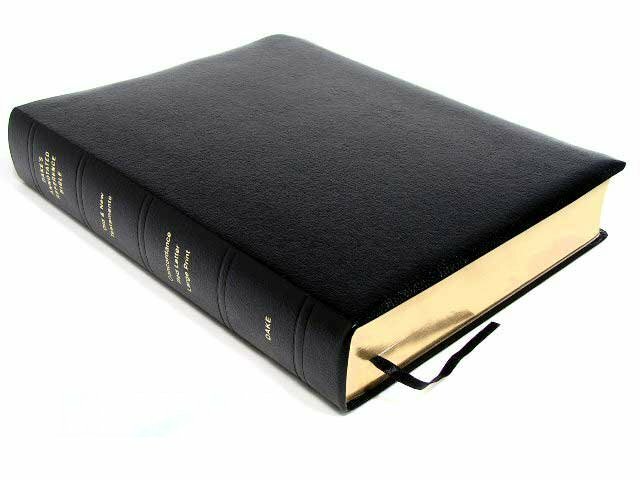 You may choose to protect your Bible, with a beautiful Bible cover made and sized especially for the Dake Bible, by selecting the "Add a Bible Cover" option below.